The beauty of these fanciful creations will take your breath away - and inspire you to bring the colors and textures of nature into your own home. Photographer David Ellwand's eye for natural beauty has brought him international renown. In this stunning new volume he uses a gorgeous array of natural elements - feathers, flowers, stones, shells, and more to explore the limits of imagination in home design as well as haute couture. Partly an inspirational sourcebook for imaginative DIY projects, partly a showcase of unique fantasy fashion, FAIRIE-ALITY STYLE is an eco-designer's dream - the ultimate exploration of truly organic materials. Both beginners and experienced artists will find plenty of inspiration in these pages, whether they are working in traditional media or on computers. The books spiral binding ensures that its pages lie flat while students follow instructions. Includes more than 350 how-to illustrations in color. I am often asked why I chose to paint faeries. The answer is "I didn't, they chose me!" For artist Linda Ravenscroft, capturing the fairy world on paper is nothing less than a calling. Enchanted is her third book devoted to these fantastical creatures, and it is her finest work yet. Linda has created images rich in detail and magic, able to transport viewers into mysterious other realms. In addition to the paintings, she reveals a little about her artistic approach but generally lets the work speak for itself. 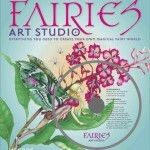 A gorgeous gift book for fairy-lovers..
Art students aspiring to diverse careers that range from book illustration to creating animated films will value this book as a solid, practical tutorial. The author instructs in methods for creating imaginative and atmospheric fairy habitats in watercolor, gouache, acrylic, and other media. She offers a wealth of creative ideas that include step-by-step instruction for transforming familiar objects into magical things. For instance, she demonstrates ways to change toadstools into homes, rocks into goblins, and leaves into carriages. She gives special attention to texture and detail in illustrations of tree bark, stones and rocks, water ripples and reflections, flowers and leaves, mushroom villages, fairy groves, and rainforest scenes. After giving detailed instruction in basic techniques, she guides students through an advanced project, 'A Midsummer Eve.' This complex mixed-media scene depicts characters and animals in a fairyland setting. The book concludes with a gallery selection of fairyland images that include moonlight scenes, fairy celebrations, and seasonal landscape scenes. The instructive text is supplemented with more than 350 full-color illustrations. Text and Illustrations of Ciruelo, Master of the Art and magic of Fairies and Dragons. The follow up to the hugely popular "Art of Amy Brown"